Ever since English naturalist Charles Darwin (1809–1882) published The Origin of Species in 1859, he has been harshly attacked and ridiculed in caricatures with the body of an ape. Yet he never said that man descended from the monkey, nor did he even invent evolution. What Darwin did was construct a whole theory from that idea, which had been floating in the scientific ether for a century, ever since Linnaeus began to classify the species by their similarities and left behind a diagram with many branches that emerged from a few trunks. It could not be a coincidence. Seeing that family tree, it appeared that the species were related and had evolved from common ancestors. That inspired a certain Erasmus Darwin to write a poem that hinted at biological evolution and, much later, his young grandson Charles would see it very clearly after a trip around the world aboard the Beagle. 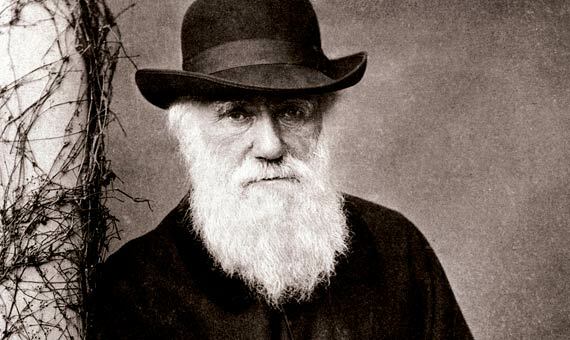 Charles Darwin made a stopover in the Galapagos Islands and there he found many clues. The main one was that he discovered several species of a bird, the mockingbird, with slight differences between them, especially in the beak. Why? Another clue was found by reading the economist Malthus, who, at the start of the Industrial Revolution and with the rising problem of urban overpopulation, thought that many more people were being born than could survive, due to the lack of food and space. Darwin applied that idea to nature: creatures multiply and, in struggle to survive and reproduce, those that flourish are the ones that are better adapted, that are born with some advantage, like a slightly harder beak. Their offspring inherit the trait and, little by little, it becomes more common and eventually turns into a robust beak with which some mockingbirds specialize in crushing seeds. And they continue to thrive and change for thousands of generations, ending up as a different species that can no longer mate with the primitive mockingbird, nor with another that has become specialized in eating insects. He had discovered the engine that drives evolution—natural selection—stirring up a cocktail of ideas that were within the reach of many people. So while Darwin let his theory evolve for more than twenty years, Alfred Wallace came to the same conclusion with a single stroke of intuition. However Darwin is given primacy and recognised for his efforts to gather evidence and analyse the pros and cons with great care. Even so, Darwin did make some mistakes; specifically, he never explained the origin of the species—he did not understand what it is that drives the motor of evolution, generally very slow. Today we know that the cause is genetic mutations: we know about cases of rapid evolution, such as bacteria that in a few years become resistant to antibiotics, and we have also found that the genomes confirm the kinship between species. Under that new evidence Darwin’s theory continues to flourish. It was born with many advantages over non-scientific explanations, which are only hypothesis impossible to prove. As in a natural selection, ideas in science come and go, and, in the end, the ones that survive are those that are best adapted to reality. In 2017 a survey indicated that 38% of American adults believe that God created humans in their present form at some time within the last 10,000 years, marking an all-time low since public opinion studies started to regularly make that question.